Kendall was playing up the sprain a bit this morning and Tia said she could go in late. I had to get her ready around 10 and it took an hour of Pleading, arguing, cajoling, reasoning and more to get her there. 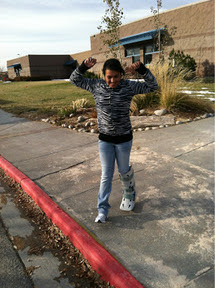 We tried crutches, then a boot, then an ACE bandage, back to one crutch, then finally a wrapped ankle in a boot. She said she would be embarrassed to be seen injured and I suspect some girls might give her a hard time. Eventually we went, I walked her in and we explained to her teacher she had hurt it at tennis. The kids crowded around and kept asking how she was. When I picked her up, she hadn't been embarrassed but she didnt like all the attention. I bet te boot stays home tomorrow.